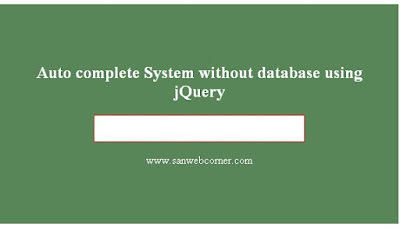 Auto complete system one of the simple thing, It will done by using Jquery. Now we will see how to create auto complete process to the input field by using manually given keyword by the programmer. This process is very useful to the user. When user types the keyword it automatically shows the suggestion tho the used based on the given keyword. There is two ways to complete this process one is auto complete based on the database data and another one is based on the given keyword.For this concept there is no need any database. In previous session i showed you here how to create auto complete system with database. I hope this below example will help you. Check out my demo page in below link.